Subhana’allah! The first ‘rosebush’ in your garden is in full blooms! So glad to have crossed paths with this wonderful ‘chaman’. Your words were felt by the veins tied to the Light. And I could almost feel your heart whirling to the Beloved’s “ney” — playing, breathing right into your soul. A treasure you have in you, Umr. What I like about this poem is the repetition of words in each stanza and across the three stanzas, eg, ocean, tears, eyes – this is in keeping with the cyclical, repetitive motion of the Dervish. Also, you bring us full circle with your ‘symphonies’ in the first line and then ‘flute’ in the last – again, very appropriate and satisfying for the reader. It’s lovely and I’m looking forward to reading more of your work. 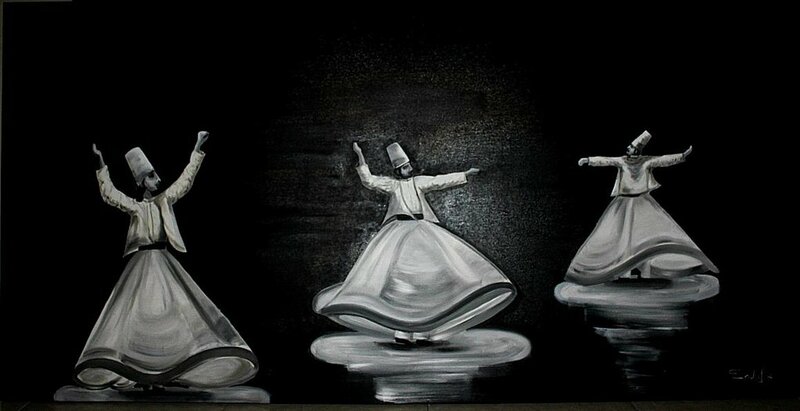 I’m guessing you have watched Dervishes perform live? My gravatar is a photo taken in Turkey, very, very close to Metvlana Rumi’s burial place. It was an awe-inspiring occasion. Thank you for sharing your poetry. Jazake Allah Khaire. Please do – I welcome all comments. It’s only a short extract of Dreams of Yasmeen, but sets the scene and introduces one of the main characters.